Beauty Costs > How Much Does Amethyst Stone Cost? How Much Does Amethyst Stone Cost? Amethyst, a type of quartz found across the world, is a semi-precious stone located inside geodes. 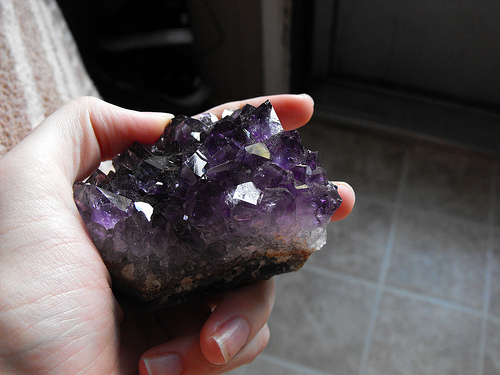 “Amethyst.” (CC BY 2.0) by Holly Leighanne. How much does amethyst cost? The cost of amethyst depends on its size and quality, including the faceting, market value, color, clarity, cut, and aesthetic appeal. Based on these factors, most amethyst, whether polished or in its natural raw form, will cost $2 to $30+ per carat. Most amethyst jewelry can range from as little as $6 for a necklace to about $15 to $50 for a necklace. Highly rated raw amethyst necklaces on Amazon.com, for instance, retail for about $8 to $40 depending on the size. This GemVal.com chart notes that the prices can vary from $4 to $35 per carat, and the cost will depend on the color and how common it is. On this PriceScope.com forum thread, a forum member asked what her stone may be worth. According to some members, they stated that a rare stone with no flaws can cost $50 to $75 per carat. eBay had hundreds of active listings, with natural bulk clusters retailing for close to $30 for nine pieces to as little as $5 for a small two-ounce bag. In terms of size, most amethyst can grow quite large unlike other gems in the quartz family. However, there are few clean examples of amethysts of 100 or more carats. On the Mohs scale of hardness, an amethyst is a seven meaning its surface can’t be scratched by any stone with a hardness of less than seven. The gem does vary in color, but the higher the prevalence of iron is in the crystal, the deeper the purple color will be. The color can also be artificially treated by applying heat to deepen the color. The estimates above are for the stone itself, not the setting. The more complex your setting may be, the more expensive the piece of jewelry will be. A single amethyst in silver may be as cheap as $50 to $100, while an amethyst in gold or platinum that is accompanied by diamonds could cost hundreds of dollars. Amethysts of high quality will be clear and should not contain inclusions. The edges or prongs of the stone’s setting in the ring need to be secure, with no sharp or loose edges and no chips within the stone. Closely inspect the stone before purchasing it since it may not be able to be returned. Amethyst has a tendency to fade if exposed to too much sunlight. In case you will be out in the sunshine for a length of time, you need to remove your Amethyst or turn it to the inside your finger. Be aware of fakes before making a purchase. A fake will often have no impurities, it will be clear and will be easy to scratch. Also, if the price is low, this can be a red flag as well. Always review the reputation of the jeweler before making a purchase. Clean your jewelry regularly since soap scum and oils from your skin can cloud the stone. To clean, the GIA recommends cleaning with warm soapy water. Ultrasonic cleaners are safe except for instances where the stone is either dyed or treated by a fracture filling. Steam cleaning isn’t recommended. Do not wear your amethyst jewelry in the ocean or pool since the salt and chlorine can cause the stone to fade and become discolored. The greatest quantity is produced in South America, but the finest amethyst currently comes from Africa. Amethyst is an extraordinarily stunning purple gemstone and is the most salient representative of the quartz family. For thousands of years, Amethyst has been a jewel coveted by princes, kings, and religious leaders since purple is considered the color of royalty. Designers celebrate amethyst as an ideal choice for jewelry due to its regal color, a variety of shapes, sizes, affordability, and broad tonal range from a light to dark purple. These gems are often sourced from Brazil, Russia, Australis, Zambia, Nigeria, India, Mexico, Uruguay, Arizona or North Carolina. Stones that are heat treated will not lose its color as easily as a stone in its natural state. If you have access to a microscope, see if there are streaks. If there are streaks, then it’s safe to say it’s real; however, any signs of bubbles could mean it’s a fake. To the touch, real amethyst will feel cold, even in the warmer months. A true stone will keep cool, even if you were to hold it against your forehead. Due to the iron in the stone, as mentioned earlier, the stone can turn a true purple, and the highest quality will often be a deep violet or bright red. Overall, a real stone should be clean, clear and will have a saturated distribution of color everywhere on the surface. If you’re still questioning the legitimacy of the stone, consider taking it in for an appraisal so a certified jewelry appraiser can examine it. With a hardness of seven, scratch the gem with the tip of a knife. Seeing a knife has a hardness of five, this means it shouldn’t scratch the surface. If it does, then it will mean it’s a fake gemstone. Wholesale prices, such as buying on eBay, can often save you money.